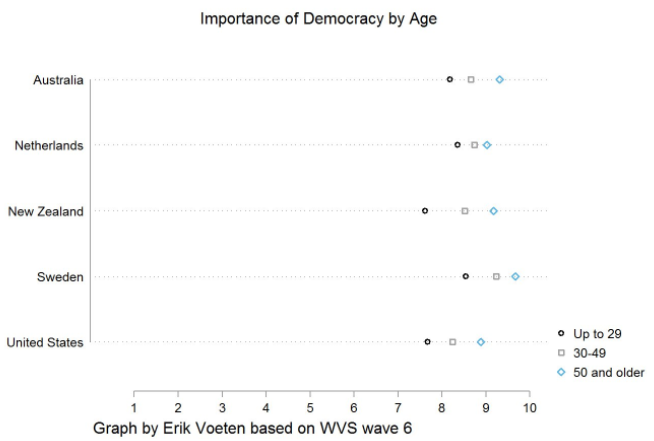 Most people are still in favor, and the gaps by age are not huge. Is democracy a reliable means to achieve such (possibly) valuable ends as human happiness/welfare, liberty and rights, or equality? Is it a process that yields such outcomes? Or is it a good in itself? (To see it as an intrinsic good may require the belief that involvement in self-government is dignified or worthy in some way.) Does democracy mean “voting equality at the decisive stage” (Dahl), or a search for consensus (Wiredu), or an opportunity for discussion that enlarges people’s knowledge and empathy (Dewey et al, not assigned)? Is democracy necessarily adversarial (Eze) or can it be unitary (Wiredu), and if the latter, is unity a good thing, perhaps a sign of fraternité? Finally, is democracy a process or set of rules, or rather a culture and set of norms and practices? My students are thoughtful, open-minded, and quick to understand various perspectives and arguments. But I think their current views are colored by what they regard as the debacle of the 2016 election–both its outcome and the campaign season that preceded it. I asked them whether they thought the election had changed their views of democracy, and they tended to think it had. They are unlikely to see democracy as an intrinsic good, because it rather seems like an undignified and disappointing spectacle. They are attuned to the dangers of communication (propaganda, group-think, polarization, selective use of evidence) and pessimistic about the potential of communication for learning and consensus-building. I don’t necessarily disagree. And I certainly don’t play the advocate for any philosophical view in the classroom. But I think that those who hope to engage such young people must make the struggle against forms of politics that they despise seem intrinsically rewarding, and must demonstrate that responsible and responsive communication is possible. I think we – we scholars who tackle the civic arena – ought to be able to give advice, and not simply advocate a life of unspecified restless action. Too often we study the politics of governments but we need to practice a different politics: of relationships and of institutions. But I don’t yet know what advice to give. I am still a little bit heeding the instructions: don’t just do something, sit there. I subtitled my guide unhelpful, and Miller reasonably agrees that it is. Yet, I find something meaningful in this vague, unhelpful result. We don’t know what advice to give because there are no easy answers and we, civic scholars and citizens alike, are in the process of figuring it out. If we somehow did have answers and we simply doled them out to anyone who would listen, such expertise would interfere with everyone else’s education. Such a process would defeat the goal itself. We don’t have answers because the task before us is to figure it out together. Miller by no means intended to suggest such a brash professionalism of civic scholarship – saying we should be able to give advice is a far cry from claiming everyone should look solely to us for instructions on what to do. But while the intentions of those approaches are worlds apart, the practical line between them may be thinner then we’d hope. One guy reached in his pocket and pulled out a pistol and says, “Godddamn you, if you don’t tell us I’m going to kill you.” I was tempted to become an instant expert, right on the spot! But I knew that if I did that, all would be lost and then all the rest of them would start asking me what to do. While may feel like we’ve failed to live up to our scholarly and civic duty if our work does not result in practical advice, Horton would argue that the goal of our work should always be education and building the capacity of those around us. We don’t have to know the answers, we have to create space for people to figure out the answers for themselves. Even when the stakes are high. Especially when the stakes are high. It’s debatable whether Horton was right to take his commitment to such extreme measures, but there’s always a piece of me that thinks he might be right. You can’t tell someone what to do when you’re just a person trying to figure out what to do. And I don’t think accepting that means our scholarship has no value. Our research can help broaden the scope of conversation, shed light on what works in certain time and contexts, but we’ll never have the perfect answer for what we should do now. Making sure that such analyses are fed into the process of public deliberation and decision making, in order to guarantee that legitimate parties to this process, i.e., citizens and stakeholders, receive due diligence in the process. This is more specific than advocating for a life of unspecified restless action, but it falls short of offering actual advice. The role of the phronetic social scientist is to add value to the public conversation. This may feel like too little in times when the questions are big and the stakes are dire. But it is, perhaps, enough…or even exactly what is needed. Then again, I am certainly not above simply advocating for a life of unspecified restless action. Some of you may recall the “Think Global, Print Local” crowdfunding campaign that a consortium of Spanish and Latin American commoners organized to finance the translation of my book, Think Like a Commoner, into Spanish. I’m pleased to report that the book, Pensar desde los comunes: una breve introducción, has now been published. It is the fifth of seven planned translations of my book. Ten days ago, Medialab-Prado, the pioneering civic and tech research lab in Madrid, hosted a public event for me and the people instrumental in funding and actually doing the Spanish translation. It was a lovely event that showed the depth of interest in the commons in Spain. Marcos García, the head of Medialab, had graciously arranged for a simultaneous translation of my talk, which focused on the origins of the book and current challenges to the commons. Then audience members asked a range of questions that took us into deeper territory. We discussed, for example, the role of the commons in piercing the veil of modernity -- the tissue of ideas we have adopted, presuming our own individual agency, rationality and dichotomies separating the world into mind and matter, and into human beings and nature. We discussed, also, the importance of arts and culture in speaking to our raw humanity in pre-political, pre-cognitive terms. And we addressed some of the difficulties that language poses in speaking about the commons -- because language tends to render invisible many ideas and meanings embedded into words centuries ago. I loved how a woman from Paraguay explained that in Guaraní, her native language, there are separate words for “we” as in a group of specific people, and “we” as in all living things, human and nonhuman. As translated into English for me, she also explained that the word “word" and “God” in Guaraní are related; the point seems to be that that one must try to use language to “build on the house of the soul.” A beautiful idea! Polis is a new way to gather open ended feedback from large groups of people. It is well suited to gathering organic, authentic feedback while retaining minority opinions. Opposition unites. As Karpf notes, the Tea Party formed to oppose Obama before he had made any policy decisions. Its original rhetoric–and its very name–implied opposition to tax increases. But Obama mainly cut taxes. That was no problem for the Tea Party, which shifted to opposing the Affordable Care Act. It was nimble about policies because its raison d’etre was opposition to a person, his core values, and the institution he controlled. Rapid response becomes more valuable. Especially in the age of social media, activist networks are good at getting people out quickly. They are much worse at sustaining pressure, negotiating, and achieving new policies. When your side shares formal power, rapid response is relatively unimportant. But when the main goal is to block policies coming from the other side, rapid response pays. By the same token, it becomes harder to advance a positive agenda when a movement must spend all its time blocking new initiatives from the government. Maintaining political discipline will be an enormous challenge. As Rustin reminded his fellow Civil Rights leaders in 1965, the point is to win. That requires mobilizing and inspiring a majority of Americans, not just fellow travelers. National Review’s Jim Geraghty tweeted earlier today, “Anti-Trump protesters are gonna take the bait, aren’t they? They’re gonna burn flags, thinking they’re irking him, but alienating majority.” It’s very hard for any large, loose network to remember what the majority of people value, let alone maintain message-discipline. Whether anti-Trump movements can manage that task is enormously important. See also: we need SPUD (scale, pluralism, unity, depth); to beat Trump, invest in organizing; building grassroots power in and beyond the election; and democracy in the digital age. Support NCDD Today for #GivingTuesday! With the madness of the holiday shopping season now in full swing, it’s often easy to forget that this time of year is supposed to be about giving – sharing of what we have and supporting our communities. But today is “Giving Tuesday,” a day created to celebrate and support giving and philanthropy as a counterbalance to the “Black Friday” and “Cyber Monday,” and NCDD wants to invite you to join in commemorating it with us. This #GivingTuesday, we are encouraging all who are able to give in support of NCDD’s important work. After a tremendously polarizing election and increasing concerns over our ability to bridge our divides, the need is greater than ever to support the community of people dedicated to helping our nation listen to each other, learn from those we disagree with, and find common ground for action. NCDD does just that kind of crucial work, and we are inviting you to help us keep doing it by making a tax-deductible donation on this #GivingTuesday. Many people recognize NCDD as a facilitative leader for this vital community of practice and the”go-to” organization for improving dialogue and deliberative capacity. But what many don’t realize is that NCDD is a small non-profit that depends on memberships and donations to remain a healthy organization. We run mostly on the our members’ yearly dues payments, donations, and a few small grants – that’s it. With that meager funding, we are still able to bring the field together during our biennial conferences, maintain one of the largest online collections of D&D tools in our Resource Center, tackle challenges and explore innovations in the field through our Confab Calls and Tech Tuesday events, catalyze efforts like the #BridgingOurDivides campaign, and begin to support and connect rising young leaders in our field with our new youth program. Just imagine what NCDD and the field could do if we had more. We’re joining #GivingTuesday in the hopes of not only spreading awareness about the important work we do at NCDD, but encouraging you to actively support NCDD by joining as a member, renewing your dues, or making a donation. Your involvement in and support of NCDD is critical to our organization and our field. Thanks for all you do in your own work and in your support of our network. We look forward to continuing to work with you and our vibrant community in the year ahead! Over a period of fifteen days the eight multidisciplinary teams taking part in the international workshop for create prototypes to activate collective intelligence and improve democracy and civic engagement.